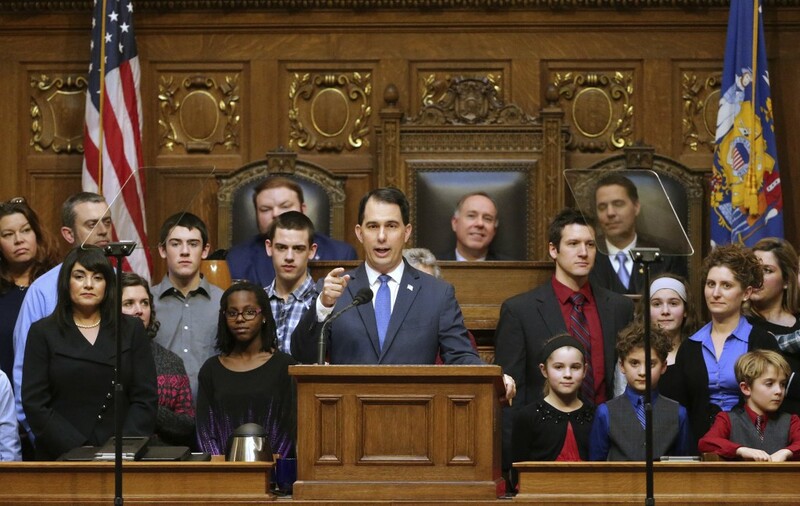 MADISON, Wis. (AP) — When Wisconsin Gov. Scott Walker leaves office in January, he faces being out of work and off the government payroll for the first time in more than a quarter century. He hasn't said yet what he plans to do next, but at 51, there's plenty of time for Walker to mount a political comeback. Or, as he hinted on the campaign trail, he could go in a completely different direction and join the ministry like his father did. "The poor guy, he's got to consider all options," said former Gov. Tommy Thompson, who campaigned for Walker. "But first he has to get over the pain of losing. That's a hell of a lot of pain." Walker has been in elected office since 1993, when he was 25. Other than a brief stint working for the American Red Cross after he dropped out of college in 1990, Walker's job has been politics. After nine years in the state Assembly, he spent eight years as Milwaukee County executive followed by eight more as governor. His life has been focused on climbing the political ladder, and he wanted to go even higher. In 2015, Walker ran for president but dropped out that September. He rededicated himself to winning a third term as governor, but lost narrowly to Democrat Tony Evers, who painted Walker as a career politician who cares more about himself than the people of the state. Walker is not wealthy. Based on his most recent statement of economic interests, he has two retirement accounts each worth less than $50,000. He has three other funds valued between $15,000 and $150,000, total. He's carrying more than $100,000 in student loan debt and credit card debt between $15,000 and $150,000. When he was first elected governor in 2010, Walker kept living in his Wauwatosa home. But in 2016 he sold it and moved into the governor's residence, where he will live until his term ends on Jan. 7. Other former governors — most much older than Walker when they left — offer some clues about what he could do. Thompson, 59 at the time, left midterm in 2001 to join then-President George W. Bush's administration as health secretary. After leaving that job in 2005, he made millions working as a health care consultant and lobbyist in Washington and sitting on corporate boards before an unsuccessful run for Senate in 2012. Conversely, Democrat Jim Doyle mostly retired after leaving the governor's office in 2011 at age 65 and largely dropped out of the public eye. There are lots of options for Walker. He could join a television network as an analyst, make the rounds on the national speaking circuit, become a lobbyist or work behind the scenes for conservative groups or think tanks. He has friends in all of those worlds but has never shown much interest in any of them. Thompson said he expected President Donald Trump's administration would be interested in having Walker join in some capacity. Walker insisted after Trump's win that he didn't want to join his Cabinet or turn to lobbying to capitalize on his close relationship with House Speaker Paul Ryan, who is also leaving office. Walker could run for Senate in 2022. That's when Republican Sen. Ron Johnson's seat is up, and Johnson has said he doesn't plan to run again. But Walker has never expressed interest. Stephan Thompson, a close friend of Walker's who ran his successful 2014 re-election campaign, said he anticipates Walker will be in demand to offer political and policy advice, both in Wisconsin and around the country. "He has a tremendous following around the country," Thompson said. "He's been successful because of his communication skills in advocating for conservative reforms." Since his defeat, Walker has kept to himself. What he has said, including a statement Wednesday conceding to Evers, has come through Twitter. Several of his messages, from Election Day and afterward, have been deeply religious. One Bible verse Walker tweeted said, "For I know the plans I have for you, declares the Lord, plans to prosper you and not to harm you, plans to give you hope and a future." Walker's father, Llew Walker, was a Baptist minister. He died in October, a month before Election Day. Not surprisingly, Scott Walker didn't say much publicly during the campaign about what he would do should he lose. When asked about it by the Milwaukee Journal Sentinel, Walker told a story about his dad — a week before he died. "A long, long time ago, when I was a kid and I'd fill in for my dad once in a while, some of his church members ... were surprised I didn't go into the ministry," Walker said. "So who knows, maybe I'll see what God's calling is. I don't know that it would be that specifically but maybe there's some calling related to that, some sort of ministry."